this week you can win $250 towards any in-store or online food and retail purchase from ! choose from cool kitchen accessories in their online , a calming detox bath set, or yummy snacks. 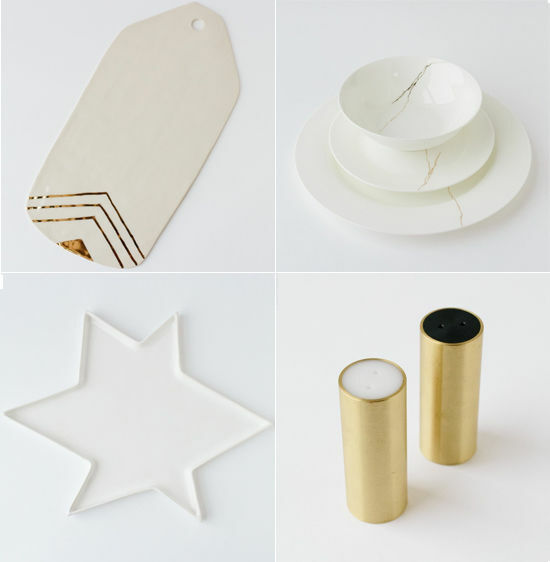 a café, catering company and retail boutique wrapped into one, Nourish features a curated selection of gorgeous tableware by unique artisans like this star-shaped platter and these gold salt and pepper shakers. 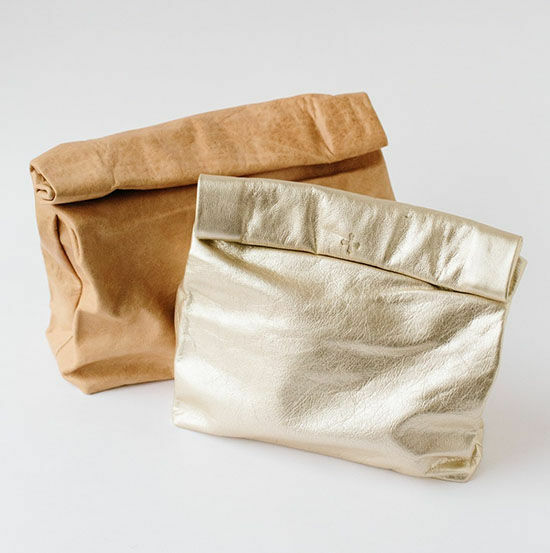 i love these gold and silver lunch pouches! see details on how to enter below. open to international readers! here’s how to win… | this giveaway is now closed! 1) visit the nourish and take a look around! 2) leave a comment below with a link to your favorite items! one winner will be chosen on wednesday, april 15th at 10am PST. open to international readers! giveaway not valid for catering orders, events, or the cleanse service. use the coupon code DLFxNKT for 15% off through 4/30. Beautiful bone china with gold “crack”! I love the large marble plate and lip tease mugs!! I like the grey bowls! I love this white and gold dish! I think these are especially beautiful! I love the White and Gold Cutting Board! Love this flatware set!! So many gorgeous pieces!! those facet mugs are pretty bangin! With these gold hammered servers, my salad will always looks glamourous!! Love it! I love these grey trio bowls! I really like this textured pebble bowl with gold rim. Thanks for the introduction to Nourish… everything is so dreamy! I’d be proud to own any of their pieces, but I particularly like the Brass Lift Coasters – I’ve never seen anything like them. Thank you so much for this giveaway ! I just love their clutch ! I really want this gold flatware. Love the white Sylvia stacking & folding bowls! I’m always needing more serving plates and this marble one is incredible! their products are so pretty! i would love to purchase the cloth coasters – cloth is my favorite material for coasters () and the crack of thunder place setting (). The geometric bowl would look perfect on my new kitchen table! so hard! but the St. Marks Studded Bib Apron is adorable and I am in desperate need of one! i really like this: ! I love the lunch pouches, how cute! We’ve been needing a tray in this house! Such a great mix of items! I love the Mia Oblong Serving Platter; it’s such a great piece for spring and summer! . The White Apple Trinket Box has also caught my eye and reminds me of almost a modern-day Snow White! I’m pretty in love with these drip tease mugs! A perfect morning: A large piece of the lemon rose tea loaf on the Gold Lip Dish! Love the drip tea mug! I love the Sylvia Stacking Bowls () and these beautiful salt and pepper shakers ()! I want the olivewood and bone salad servers! Love the white stacking bowls! i love the apple trinket box! Well to narrow down is near impossible! The Oslo Gold Matte Flatware set is certainly a stunner. These place settings are so beautiful! Loving the Brass Perimeter Tray! It would look so cute on my coffee table! wow, so many awesome things! but this gold flatware set is stunning! The facet mugs or the drip tease mugs… I think I’m a mug junkie! I LOVE this Brass tray! Seriously love it. Beautiful site in every way. This platter is simply stunning! I think my favorites have to be the Mia Serving Bowl, Partial Zag Dish, and the Felt Cut-Out Trivets! The geometric bowl is absolutely amazing!!!! I can’t decide between the Geometric Bowl () or the Vintage Black Tumbler Glasses ()!! The Brass Perimeter Tray is absolutely gorgeous! Love how unique the large bang plate is. Would just love that on my table! This plate set is stunning!! I loooove these mugs! They’re too pretty! Love these gorgeous stacking bowls, great for storage! Oh so many choices! I’d love to get some gold flatware like the Oslo Matte Gold set or the white Geometric Bowl which is the perfect mix of refinement and edge for me! Beautiful shop! The gold lip platter and all items in that set are my favorite: . I’m a sucker for nesting bowls. And these are so pretty. This White Apple Trinket box is just beautiful! I cannot express enough just how obsessed I am with everything Nourish. Marissa has created a true utopia in the west village. I have been dreaming about the large bang plate since the day I first stepped foot in NKT: // perfect blend of simplicity and statement. This instantly transforms any table into a stuning composition, love it! I like to show off my food. This serving bowl is perfect! The Dex Coasters are awesome! Love the Partial Zag Dish as well! I love everything but favorites include the gold flatware, the lip tease mugs, and the marble platter! The drip tease mug is designed so simply and so beautiful; perfect for a coffee addict like myself! Beautiful! Petit Bang Plate and Geometric Bowl are my top items! I love the Gold Hammered Servers. I love the gold striped ceramic cheese platter! I looooove the shibori apron. The crack of thunder place setting is stunning! Oh my gosh, this tray is so gorgeous!!! The Middletons Melamine Plate Set would make a great addition to my dining set! Such lovely colors! i love this! im obsess!! LoVEEEE the Oslo Matte Gold Flatware!!! I have brass cutlery and it would match so nicely! Those tan and platinum lunch sacks are gorgeous! I’d love to tote some homemade snacks to meetings in those chic bags. Regardless, I am kind of in love with this whole website! I am obsessed with the platinum lunch sack! It serves it’s purpose while staying oh-so stylish. You had me at those gold salt and pepper shakers! Gorgeous! I just got some gorgeous vintage China (World War II era! I’m dying!) With hand painted gold on it and this flatware ( maybe a few serving platters!) From nourish would be amazing! Nourish is a dream! I am especially fond of the hand-dyed shibori apron and the Agnes serving bowl! In love with this Gold striped ceramic cheese platter! I love the Partial Zag Dish! It is like I made a shop of all my favourite things, beautiful! The Agnes serving bowl is lovely! Thank you for hosting! Salto Coasters or Marble Large Plate. the drop tease mugs are crazy cool. I love pieces that embrace everyday experiences, like coffee dropping down the mug. Oh my, those gold hammered servers! lunch pouches are the best!!! the crack of thunder place setting is so beautiful and white and gold is one of my favorite color combos! I mean seriously. These nesting bowls?! DIVINE! These coasters are adorable! I love when aesthetics & function come together! And the bath salts sound amazing!! Love this beautiful cheese platter! I Love the Lolo Brushed Flatware! So perfect. So many good things! I love these stacking bowls! These would go perfect with our gold flatware from here! I like the stacking bowls! The crack of thunder place setting is so ridiculously elegant and timeless I’m obsessed!!! This bowl is on point! Would love to serve out of it! The facet mug or the vintage black tumbler glasses… wow, touch choice. I’m MAD for the Sylvia Stacking & Folding bowls. As the description puts it- These bowls are the hotness. ’nuff said. I am in the need for some new glassware and these would be awesome! The gold ceramic striped cheese platter is amazing! LOVE the large marble plate! I would nearly kill for a Felt + Fat marble plate! I’m already a fan of their work so to own pieces by them would be such a dream. Oh gosh, this tray is AMAAAAAAAZING. LOVING the matte gold flatware look! These are perfect! I want 1 of everything!!!! Love love love the honeycomb studio cheese platter as well as those fab lunch sacks!!! Pick me! Pick me!!! The gold ceramic cheese platter is lovely! Wow, really great pieces on this site! I love the Sylvia Stacking Bowls! I love the marble plate (it feels so greeky :p), the beautiful rosie plate and blue glass cups! Totally obsessed with those lunch bags, sheesh! I adore the crack of thunder place setting! Oh my God, it’s all so beautiful! But I especially love the Avva smoked glasses! I love the OSLO MATTE GOLD FLATWARE. I’m moving into a new apartment and could use some new flatware. The Crack of Thunder Place Setting is to die for! I have been on the hunt for beautiful dinnerware and these are gorgeous. I also love the Picnic Leather Clutch in Platinum! So hard to choose, but I am in LOVE with the Brass Perimeter Tray – perfect for my home bar! I love the Crack of Thunder Place Setting and Lip Tease Mug! We just renovated our kitchen and these dark nesting bowls would look amazing next to our soft dusty pink walls. Holy moly – my heart explodes when I saw that this is open to international readers. The matte gold flatware would warm my cold Canadian heart SO much! BUT the Ginette Tumblers would look incredible in my white kitchen. Oo the whole shop looks wonderful. I especially love the colours and shapes on the Middletons plates or marbled plates just look delightfully timeless. If only! the perfect decoration, gift and a must have in any kitchen! so many beautiful things! love the crack of thunder place setting! magical! i love these salad tongs! I love, love, love white and gold for serving dishes. These are fancy enough for a nice dinner party, but rustic enough for a casual get-together too! Been wanting gold utensils for sooooo long! I love the gold lip platter, but really everything is wonderful! I never thought I could like kale salad until I had Nourish’s. I’d love all the gold bowls! Love the wood salad servers! I don’t have any myself yet. Hard to choose but…i will! i have been seeing the lolo brushed flatware in food photos and absolutely loving them! This geometric bowl would look perfect in my baby kitchen! Gorgeous things. Crack of Thunder because I adore the concept of Kintsugi (repairing cracked porcelain with gold dusted lacquer). One day I want flatware like the Oslo Matte Gold Flatware – something different! I love the Drip Tease mugs! LOVE the brass serving spoons and those on-trend lunch pouches! In love with this cheese platter! This silverware set is GORGEOUS! Love the Crack of Thunder place settings! the lunch bags are too cute! i just throw all my lunch in my tote and it often spills this would be great! I would love any of the items by Ladies and Gentlemen Studio. I also like the brass lift coasters! I adore these apple trinket boxes. Have you ever seen the movie Blancanieves (I breathtaking Spanish take on Snow White set in the 20s)? These reminds me of that movie in the best way. The “Bang” plates are so cute! (Repeat post, with link this time): The “Bang” plates are so cute! the lip tease mug is so cute & funky!! I like the apple, reminds me of the poisonous apple in Snow White! These plates are also really cool! THE MIDDLETONS MELAMINE PLATE SET makes my heart sing! Love it. I love everything, but these plates are amazing. The gold flatware is amazing! So hard to choose. I LOVE EVERYTHING but this Gold lip dish stole my heart. I love that Brass Perimeter Tray! Wow, beautiful shop! The Brass Perimeter Tray is gorgeous! I love the picnic leather clutch! I love those mugs, they are really cute! 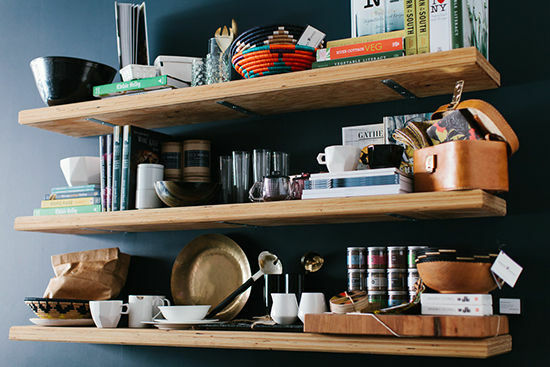 Love love love the Lip Tease Mug () and Oslo Matte Gold Flatware ()!! The lunch leather clutch in tan is just gorgeous! Swooning over this apron and the gold/silver picnic bags!!!! It’s hard to choose, but I do love the smoky whiskey glasses! Loving the Large Marble plate! So Stunning. Wow! So many great items, but I especially love this cheese platter () and these coasters (). It’s so hard to choose but thanks for sharing this site-hopefully will buy one day! I love the leather lunch clutches! Beautiful! sort of like the little black dress for your (no, i mean mine) table. thanks for this chance. love their stuff. I love the Middletons Melamine plate set! The gold lip platter is so lovely! Luuuurrvee the gold forks, knives, and spoons! LOVE this plate set, also my partners last name is Middleton, which is a great coincidence! Love the grey bowl trio!!! How great is that ceramic tag-shaped cheese plate? I want two of them! I can’t find the lunch bags on the website?? I’m in love with the Oslo Matte Gold flatware!!!! I love the Geometric Bowl . I actually bought a candle today because the jar had the geometric design. I love it! And the Sylvia bowls are lovely as well! Definitely the matte gold flatware set!!! Gorgeous and timeless! i would love to win this giveaway since my boyfriend and i just move in together! I am torn between the Crack of Thunder set, the Agnes serving bowl, the brass salt & pepper shakers and the cheese platter. Oh my goodness. I wish we had something like Nourish in Brisbane. Gorgeous! I especially love these brass salad servers: For some reason, I still haven’t bought myself some salad servers! Love love love the clutch! These bowls are the best!! The Lip Tease Mugs..OMG WOW! If I dont win I’m deffo going to try DIY them! I lovelovelove the large marble plate! this dinnerware set — so, so good! This marble serving plate is AWESOMMEEEE. I need these in my life so that my boyfriend can stop ruining our nice handmade wood furniture! At least he’s drinking his tea? 🙂 We’re both so particular about design and those would work perfectly in our loft! I love these Brass Lift Coasters! or how about these Sylvia Stacking and Folding Bowls! I really like the Brass Lift Coasters () and the Crack of Thunder Place Setting ()! So many servings of lovely dish design! I would love a few of those large marble plates! I’m sucker for cheese and anything gold soo… gold striped cheese tray? Yes please. Really love these drip-tease mugs – so cool! I love this brass perimeter tray! I love the stacking and folding bowl set in white. Gorgeous! Love the Gold Lip Platter – so elegant! Yep… definitely those gold and silver lunchbags! Can never go wrong with gold and silver! Love the Oslo gold flatware! I have been wanting a bag JUST like those lunch bags but I can’t find them on their site!! But the gold flatware is pretty great too. Those brass lift coasters. YES PLEASE! I am moving in six weeks and would love to brighten up my new place with pieces like these. I love the Lolo flatware and the brass salt & pepper shakers! Love everything! Especially the gold platters! I’m obsessed with these Drip Tease Mugs! I am in LOVE with the “Partial Zag Dish” with the cute little golden chevron stripe! i’ve been looking for plain bowls for a long time! i love these! Love the Geometric bowl! It’s simple yet visually interesting. Hope I win! So… I definitely need that Bang plate. So fun! That was a hard choice! I think the marbled platter is my favorite shop item though. Love the Marie Turnor clutches!!! Well, this is so ridiculously gorgeous it’s wacky: . Thanks for offering another great giveaway, Bri! I absolutely love the gold lip platter- and everything else! It’s all so beautiful! oh, such a great collection of kitchen goods! i pretty like this one, but its kind of hard to choose. Urgh. This is so hard to chose. I want EVERYTHING. My kitchen is in serious need of an upgrade. I still have all of my plastic bowls from my college dorm room. Going to have to go with these ultra sophisticated grown-up ceramics. I think this apple trinket box is absolutely adorable! My favorites are the Sylvia Stacking & Folding Bowls – White and The Middletons Melamine Plate Set. Crack of thunder place setting! I LOVE the partial zag dish. I’d probably use it as a ring dish! Sooo pretty !! Thanks for this INTERNATIONAL Give-away – I am from France, MERCI! I love pretty much everything, but this bowl really caught my eye! The Brass Perimeter Tray has such a clean, solid design- it would be perfect to serve my guests! Reader all the way from the Philippines here! Finally something for us 🙂 Thank you for the chance to win. How can I pick just one item? Omg these plates caught my attention right away because they look like they’re made of marble, but instead of veins of grey they’re GOLD! But you can’t have plates without flatware, and these are clearly the supreme ruler of all flatware and would compliment those plates perfectly. I love love LOVE the oslo matte gold flatware. Gorgeous! This plate is gorgeous: . Beautiful ceramics! I love the ‘Lip Tease Mug’, so cute! Now that I am finally getting into cooking…time for an apron! Anything with “gold” details and a chevron look is for me. The bonus is that it’s a cheese platter, and who doesn’t love a cute cheese plater?! I love these Drip Tease Mugs! The gold or silver drip on the elegant white porcelain mug reminds you not to take life too seriously, and that sometimes messy can mean beautiful! This marble platter is gorgeous. need the gold lunch pouch! Love the partial zag dish! I love the Agnes Serving Bowl! I love the Agnes and Mia serving bowls! I love the Middletons Melamine Plate Set – and only $36!!! I like the marble plate, the hand-dyed shibori apron, and the mimi indigo napkins. Gold flatware is so beautiful! Love that it is dyed by hand! I love the chic textured little bowls so fun to add into a kitchen by the sink to put rings in while you are cooking or doing dishes. Obsessed with the gold flatware and lip tease mugs! so chic and minimalist, but with flair! I’ve have just become obsessed with basically everything in their shop! What an amazing aesthetic they’ve cultivated! Love the gold striped ceramic cheese platter! Have to go with the Partial Zag Dish, but basically I love everything. The gray bowla and the leather coasters would be nice – but what really got me is the white geometric bowl – so beautiful! I also love these, they are so gorgeous. Must save up for them. Swooning over the Geometric Bowl! We are in serious need of more serving bowls. I love this one: . But I also adore Honeycomb Studios: ! I’ve never heard of Nourish. Looks like a really cool shop. I love those serving spoons in your picture above, but I couldn’t find them on the website. Also love the facet mug. Looks like the perfect size. I love this one: It’s absolutely beautiful and something I’d probably use a lot. The large marble plate is awesome! What a stunning and simple accent. I like the Brass Cylinder Salt & Pepper Shakers. Whoa. These salto coasters are fab! the black apple trinket box looks so amazing! the lip tease mug, the black apple trinket box, the ginette tumblers, mia serving bowl, grey bowl trio…… OMG. Wow! I could buy it all, every item is beautiful. My favourite are the Drip Tease Mugs. I love this bowl! It looks different but not too different that it might be out of place. It was very hard to choose just one, but this mugs are heaven! Oh wow everything was gorgeous but my favourite would have to be the Facet Mug. and pretty much everything else! The Salto coasters would look AMAZING in my living room! My favorite item definitely has to be this gold-striped ceramic cheese platter 😀 So pretty! I love anything with a gold accent! Thank you for this giveaway! Love the Olso Matte Gold Flatware! The crack of thunder place setting is gorgeous. I love the crack of thunder setting! Can I have the costini? So Amazing. Or this ope tray. Love the gold accent on these plates! love the geometric bowl and the crack of thunder china! Love the cups and aprons! Love the lip tease mugs!!! It’s a really nice shop with many beautiful things, but this one is by far my favourite. It’d be perfect for cheese, or maybe for candles on the dinner table. Definitely my favorite! I love serveware (and I love that it was inspired by Morocco). Thank you for the chance to win! I love the gold lip platter: , these gold hammered servers: , and this grey bowl trio: . So pretty! What beautiful items – yay for interational contests, too. Love these gold lipped platters is definitely one of my favourite items. Stacking bowls are also to die for! The Crack of Thunder Place Settings are beautiful, but how do you just pick one thing you love? I also am a huge fan of the leather Clutches, especially the tan one! NEED those salt and pepper shakers!! Please please please please please please! I can’t get my eyes off the gold-lipped platter or the gold-striped cheese platter! They’re so lovely. Love the OLIVEWOOD & BONE SALAD SERVERS. Black & Gold. Classic or what! and these mugs are so neat! and the colour of this bowl is amazing! Everything on here is absolutely stunnning. Gold and white anything will steal my heart, but I love this pebbled bowl with the gold rim! The marble plate and matte gold silverware are absolute MUSTS! I’m smitten with all of their white and gold dishes, particularly the “crack of thunder” bits. Great name as well. Oh the gold lip platter is calling out my name! Thank you! 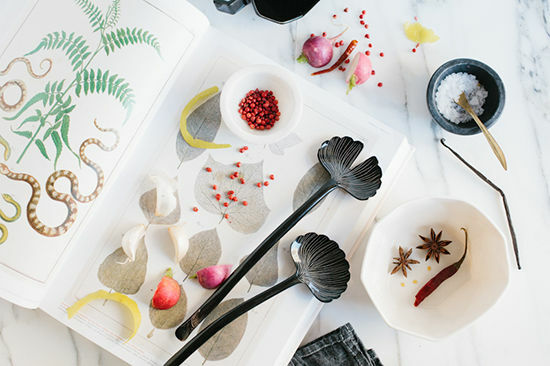 DesignLoveFest & Nourish Kitchen + Table. So fun looking around, and dreaming! I know it’s not available yet (hopefully soon), but I love the Agnes serving bowl. This set is absolutely to Ahhhhh for! It’s time to upgrade my silverware to goldware. I’m in love with the twill blanket in dark gray and the pattern on these throw pillows! This is my absolute favorite! Gold forever.